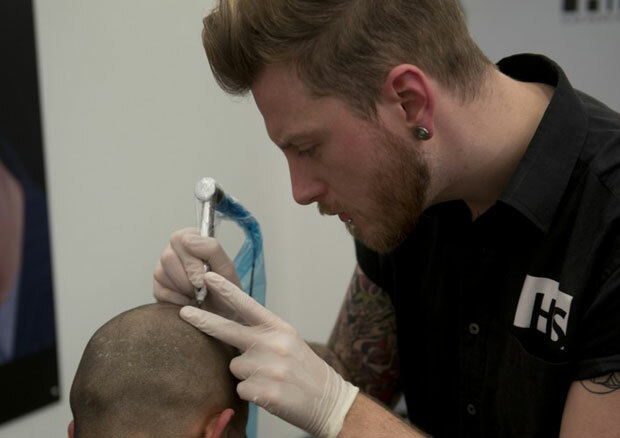 HIS Hair Clinic opened the first mainstream scalp micropigmentation clinic in the world in 2002. The clinic was located in Birmingham’s Jewellery Quarter and the company has since grown to become the largest SMP provider of all with more than 20 locations around the world. Scars are an unfortunate yet inevitable by-product of hair transplant surgery. Some are worse than others, and whilst it would be fair to say that the size and prominence of these scars has decreased significantly in recent years thanks to modern hair restoration methods, scars are usually still visible and many people bear more prominent scars from less advanced procedures. It gets worse. In years to come I anticipate an explosion in the demand for camouflage solutions, as todays generation of HT recipients continue to lose hair and can no longer use their remaining hair to hide the hallmarks of their procedures. It’s great that hair restoration is becoming less of a taboo subject, due largely to the number of celebrities now admitting publicly that they’ve had work done, but this is creating a boom in demand and many people cannot afford the high prices charged by the best surgeons. Many men are being sold the dream by chop-shop surgeons and will live to experience the consequences. It is important to recognise that not all HT scars are the same. Strip scars are the most common, and are the result of simpler FUT (follicular unit transplantation) techniques that are still widely used today. Skilled surgeons tend to achieve thinner, cleaner, flatter scars, however most strip scars remain highly visible. FUE (follicular unit extraction) scars are much more discreet and consist of multiple round scars in the donor area (usually the back of the head) and smaller scars in the recipient site (usually the frontal hairline or crown area). Plug or cobblestone scars are the unfortunate consequence of outdated surgical methods that were widely used in the 60’s, 70’s and 80’s. They are the most challenging scars to conceal, but are by no means a lost cause. 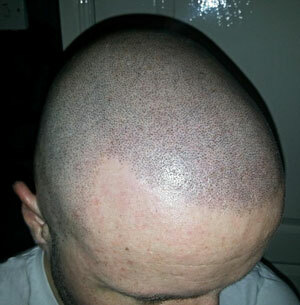 It would be impossible to say which provider is able to best use scalp micropigmentation techniques to conceal these scars, as each scar is as unique as its bearer. For this reason it is sensible to look for a broad portfolio of scar treatments (as opposed to just one or two examples) and to find case studies that reflect your own circumstances as closely as possible. HIS Hair Clinic is a great place to start. It is fair to say that the company has treated more scars than anyone else, but what is really impressive is the number of practitioners they have that have demonstrated an exceptional talent for scar camouflage. Scar tissue reacts entirely differently to pigmentation in comparison to unwounded skin, and it takes an experienced technician to make the most accurate judgments. This is experience that HIS offers in spades. This company is by no means the only one capable of camouflaging scars effectively. I’ve seen some great work from a number of other providers, but the combination of experience, demonstrated results and large network of locations makes HIS a great choice. The following photographs all represent the work of HIS Hair Clinic. What advice can I offer? During your consultation, HIS Hair Clinic usually express their anticipated camouflage target as a percentage, so they’ll look at your scar and provide an estimate of how visible the scar will be after your procedure. In my opinion, any camouflage estimate of 70% or more is worth considering as this would represent a significant improvement in the appearance of your scar tissue. If you are dissatisfied with the estimation you are given, ask if you could achieve a better result by lining up some of the chips in your favour. What I mean by this is to find out how the result could be improved. Does the scar need to be flatter? Less textured? A different colour? Once you have this information, you could consider pre-treatments such as Fraxel to improve the chances of achieving the best possible result after SMP. It may also be the case that a full head SMP treatment would help camouflage your scars more effectively. This is a common scenario and should be considered. Finally, your scars may simply need more time to heal prior to treatment. My final piece of advice is to manage your expectations. It is unrealistic to expect 100% concealment of a large, indented, aggressive looking scar in a prominent position like the back of your head. Even the easiest of scars rarely achieve 100% camouflage. Remember, the aim is to make your scar much less obvious, not to turn back time. Have realistic expectations, and you are much more likely to be satisfied with the end result. 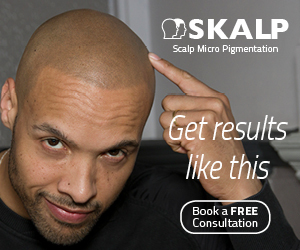 As you know, the purpose of this site is to provide information about scalp micropigmentation that is as honest as it is accurate. This means remaining unbiased. Of course we accept advertising from a number of SMP providers around the world, but only to cover the cost of maintaining this website, and their sponsorship does not affect the content we post here, or our opinions of such companies. What follows is a completely unbiased review of HIS Hair Clinic, without holding anything back and without incentive. 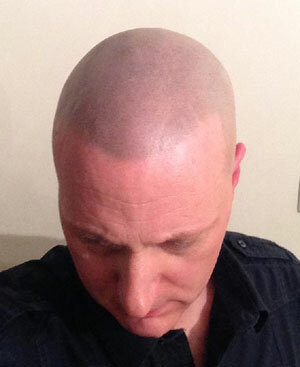 I am a regular member of the HIS Hair Clinic forum (and have been for over 3 years now), and I am also an active member of the major hair loss forums from around the world. Furthermore I have spoken with well over a hundred people who have had scalp micropigmentation treatments with various companies (including HIS Hair Clinic) who have been kind enough to share their experiences with me. My review is based on my extensive findings via all these different channels, so it is safe to assume that my opinions are coming from a place of fairly thorough and broad knowledge. HIS Hair Clinic has been around for significantly longer than any other provider. This in itself is a major plus because it proves they have a strong likelihood of still being around in years to come, when quick refresher sessions will inevitably be needed. They have more clinics than any other company (19 at last count) in the United States, UK, Europe and Asia and from what I can tell, they have the most established set-up. I’ve not been inside their new office in the UK, but any company that invests in its future is clearly in it for the long haul. That has to be admired. The company was set up in 2002 by Ian Watson and Ranbir Rai-Watson, following the passing of Ian’s brother. As a result of this difficult time Ian started to lose his hair, and this prompted him together with Sister-in-Law Ranbir to search for a solution. Hence HIS Hair Clinic, and scalp micropigmentation with it, was born. A bigger company usually means more people on hand to offer customer service, greater availability and choice of practitioners and a reputation to uphold, that should lead to better service overall. From what I am told, they have a large team at their HQ in Birmingham that handles all the calls and emails from clients around the globe. With numbers to call for the United States, UK and Canada, I’m assuming their operation must be a 24 hour thing to provide this service. More positives I would like to mention, and this next one is an important one, HIS Hair Clinic offer all customers a 12 month guarantee. There is some confusion about exactly what this guarantee covers and at what stage it comes into play versus paid-for treatments, but from what I can tell the company usually holds true to this warranty, unless there is an obvious reason why they should not. Finally, this provider is definitely the most open and transparent regarding its results. They are one of only three companies that offers its clients a discussion forum (and it is by far the largest), and despite being in a tough position as a company representative, the resident moderator appears to do an excellent job of keeping the environment as unbiased as possible whilst still ticking the boxes in his job description. The company has created well in excess of a hundred videos showing their results in as much detail as can be reasonably expected. HIS Hair Clinic also hosts a number of open days and has recently done a live broadcast of a treatment session streamed online. No company is perfect, and as long as a business operates in an ethical manner and gets it right at least 95% of the time, that is as much as can be reasonably expected. Considering the number of customers they have, they do a pretty decent job of keeping them happy. I remember a couple of years back, a handful of customers were complaining about the efficiency of their back office. Nothing particularly new here, just emails not being replied to quickly enough, staff that didn’t know the answers to some standard questions and templated responses to important issues raised by their clients. All of these issues are well documented in their own forum, and to their credit, HIS has never tried to hide these issues. Since then things seem to have improved somewhat, so I asked HIS co-Founder Ian Watson for his comments. This is what he came back with. Of course we were aware that some aspects of our service were not as speedy or efficient as they should have been. We restructured our client services team last year to address this, and since then the improvement in overall service levels has been highly significant. We know we can never promise to get it right all of the time, and like any people-orientated business we do make mistakes from time to time, but we like to think we do everything we can to put it right and ultimately satisfy our client. Overall, we believe we now offer the best service in the industry. So would I recommend HIS Hair Clinic? There are some undeniable benefits to using HIS Hair Clinic. Not only have they been around for longer than anyone else, they have the most clinics and the best availability of practitioners. Some would argue their practitioners are the best in the world, but this is clearly subjective.